Concrete Fire Bowl Square with Scupper 42'' is the perfect choice to complete your Outdoor Landscaping Design. 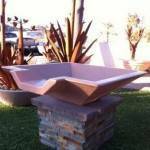 Our Concrete Fire Bowls are made with Fiber to Strengthen the Concrete and deliver years of enjoyment. Outdoor Fire and Patio has many styles and colors to choose from. All Concrete Fire bowls come with a standard 1 1/2'' Hole Cored in the bottom, ready for installation. All Fire Bowls are able to be used with Liquid Propane or Natural Gas. Outdoor Fire and Patio has over 15 years experience and will make sure that your next Fire Feature is completed correctly. Outdoor Fire and Patio is your Manufacturer Direct Source for all your Outdoor needs. 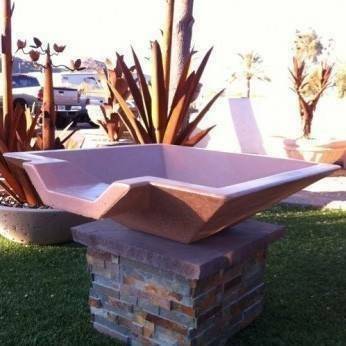 Install our Fire and Water Manifold with our Square Concrete Fire Bowl and create a unique design only you will have. Installation is easy and with the support of all of our staff at Outdoor Fire and Patio you can rest assure that you will be receiving the best products as well as the best information.